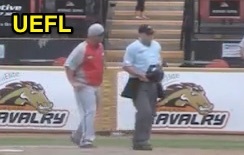 Australian Baseball HP Umpire Gavin Carson ejected Perth Heat Manager Kevin Boles for arguing a hit by pitch call in the bottom of the 7th inning of the Heat-Cavalry game. With two out and one on, Cavalry batter River Stevens took a 0-1 fastball from Heat pitcher Edgar Valle for a hit by pitch. Replays indicate the pitch did not appear to make contact with Stevens' person or uniform, the call was incorrect. At the time of the ejection, the Heat were leading, 8-2. The Heat ultimately won the contest, 9-4. This is Gavin Carson's first ejection since a bench clearing brawl on December 20, 2015 (Josh Warner [Throwing At], Dave Nilsson & David Harris [Fighting]; QOC = U).